The opening match of EPW Goldrush was born out of competitive pride as a result of Scotty Ryan and Julian Ward losing a tag team contest against The Untouchables. Before the match could begin, Amber made her presence known at ringside as she looked to add to the Untouchables family. Once the match kicked off, the two men wrestled back and forth trying to gain the upper-hand but both proved to be very evenly matched. Ward looked to gain the advantage as Ryan fell to the outside. As he played to the crowd for support, the Coastal Champ recovered and launched his own aerial assault. Whilst both men battled to come away with the Championship, Amber proved to be an encouragement and a distraction depending on the time of the match. A conversation with the wicked manager almost led to Ryan being trapped under the Stirling Bridge Slam for the three count. Showing the fighting spirit that has made him EPW’s longest reigning Coastal Champion, he also survived a top rope powerbomb as Ward seemed to be at a loss for what would overthrow Scotty Ryan’s reign. Ward seemed to be considering the advice of Amber but it only lead to confusion and the downfall of the challenger as Scotty Ryan stopped Ward with the Lumbar Check and the pinfall to retain his EPW Coastal Championship. Tag team action was up next at EPW Goldrush as Del Cano teamed with Jay Taylor to take on the TK Taskforce of Jack Edwards – Professional Wrestlerand Tipene – Professional Wrestler. has been searching for a new tag team partner. 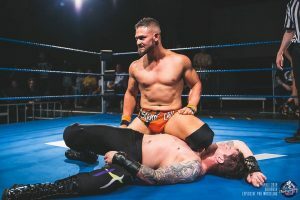 Whilst he has not had much success at EPW School of Pro Wrestling‘s Showcase events, he and “The Prince of Perth” got off to a solid start with JT hitting a magnicificent elbow from the top. 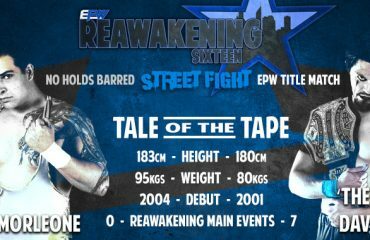 The Taskforce were able to wrestle the momentum away as Tipene took control in the ring, demonstrating the combination of power and sleek movement that saw him voted as the 2018 EPW Rookie of the Year. The self-proclaimed Co-Rookie of the Year Jack Edwards was also instrumental is pressing the advantage and keeping Del Cano away from his tag team partner. Del Cano refused to give in but a crafty reversal inadvertently lead to Tipene knocking Jay Taylor off the apron. JT saw this an opportunity to throw the toys out of the cot and left his partner Del Cano high and dry as he walked backstage. As honourable as Del Cano fought as he almost snatched an unlikely victory in this impromptu 2 on 1 situation, he could not overcome the team going from strength to strength in 2019 as The Taskforce finished Del Cano off with The Hoedown Throwdown for the victory. After the TK Taskforce was successful in tag team action, Dean Olsen looked to grab a word with the victors. He couldn’t have expected that the suspended Taylor King would have stormed the ring. Grabbing the microphone, The Child Star seemed unbalanced and not in his right mind. 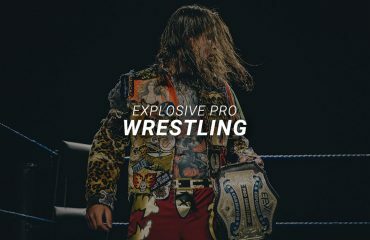 Since losing in the EPW Invitational Tournament Final he has gone off the deep end after losing in a match and moment inside the ring that meant everything to him. EPW officials have confirmed that King remains indefinitely suspended after this incident where as you can see below, he also took a pair of clippers to his own hair. We at EPW Social Media wish King a speedy recovery and hope that those close to him can reach out and get him the help he appears to need. 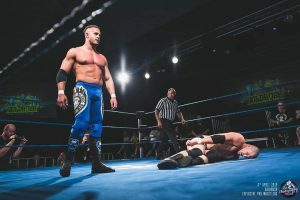 The rivalry between Dan Steel and Dan Moore has been simmering ominously for over 12 months since the backstage assault carried out by the Headhunters EPWPerth on The Nice Guy. It all came to a head at EPW Goldrush in a Lumberjack Match. Dan Steel is none too concerned with making friends as evidenced by the way he taunted each of the lumberjacks on the outside. The rammifications were felt early as Moore rushed Steel and sent him to the waiting lumberjacks who all took turns to get their shots in. Like a pack of hyenas loitering in an elephant graveyard, the lumberjacks showed no allegiance and went straight after Moore as well when Dan Steel was able to reverse an early TKO attempt by tossing The Nice Guy to the outside. Steel pressed the advantage early but Moore had retribution on the mind for the man who cost him several months of his career. Whilst he was able to find an opening for a moonsault, it appeared to take too much out of Moore as Steel was able to catch him with an impactful AA Spinebuster shortly after. The lumberjacks would play a deciding factor towards the end. Despite having Dan Moore thrown onto them via a Dan Steel Exploder suplex and a referee held hostage in front of them, the chaos they caused at the end was enough to allowed a mystery hooded figure to slip into the ring. With referee, lumberjacks and Moore distracted, the hooded figure drilled Dan Moore with a Michinoku Driver. This left Moore prone and in perfect position to fall victim to Steel’s devastating punt kick and taste defeat at Goldrush. Goosebumps. They were felt all around EPW Explosive Pro Wrestling Gate One as Mikey Nicholls returned home to EPW. However, there was no time for sentiment for Mad Mikey with the mountain known as Bobby Marshall standing across the ring from him. Mikey didn’t waste time in reminding Bobby who he is with a set of chops to the chest that sent tremors throughout the audience. 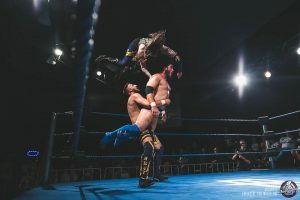 Marshall tried to get under the skin of Nicholls with heavy forearms and a disrespectul slap – actions which just seemed to further fuel the fire of Mikey. Both men are known for their wrestling abilities but these two bulls seemed intent on locking horns and slugging it our with strikes that could be felt by those in the premium seats and heard clearly by those in the last few rows. Marshall used his strength and size to gain the advantage but it was Nicholls who had more than pride on the line who fought bravely. In his first match back in his hometown for EPW in over three years, not even three of Marshall’s signature scissor kicks could keep Mikey down for the count. Though Mikey himself would’ve been at his wits end when his own signature manoever, the diving clothesline, were not enough to initally put Bobby away. Fourth time was a charm as Mikey summoned every last bit of energy to near on decapitate Marshall and come away with a huge victory. This was an all out assault from both men and if were silly enough to miss it live, make sure you’re straight onto Vimeo when Goldrush is added to see this war and the rest of Goldrush’s stacked action. Last time these two teams met it was at Vendetta in 2018 as both the Street Gang Hooligans and Kiel Steria & David Nero battled it out for the right to challenge the then Tag Team Champions. This time, it was Alex Kingstonand Logan Grey who were defending those EPW Tag Team Championships. Despite the previous match, there was a bit of feeling out as Kingston and Grey controlled the pace early. With the championship on the line it didn’t take long for the action to break down. The Street Gang Hooligans cleared the ring of the challengers before diving to the outside to take them down. Steria was able to halt Kingston’s momentum by catching him mid air and turning the tide in his team’s favour. Both Nero and Steria were able to work well to isolate Kingston from his tag team partner on the apron. The challengers put together some impressive suplex combinations but were unable to put away the fighting champions. Frustration surfaced with flashbacks to Hot Summer’s Night when David Nero looked to bring the championship belt into the ring. This time, Steria noticed the act and argued with Nero to put the belt down. 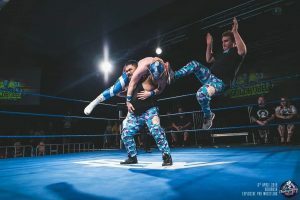 The miscommunication allowed Kingston and Grey to capitalise on the squabble and connect with the Iron Lotus to score the pinfall on Kiel to retain their championships. The Street Gang Hooligans were able to prevail but their next challenge will come in the form of The Velocities Mat Diamond and Jude “The Dude” London on May 25 at EPW Collision Course – you won’t want to miss this one either! 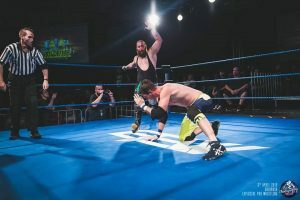 Two of the most experienced Australian wrestlers did battle in a highly anticipated singles match as Marcius Pitt (accompanied by Damian Slater and Amber) took on the Australian Sensation Craven. Both men were looking for a big singles victory. Pitt looked to “derail another hype train” while Craven wanted to make his mark by defeating the 5-time EPW Champion. 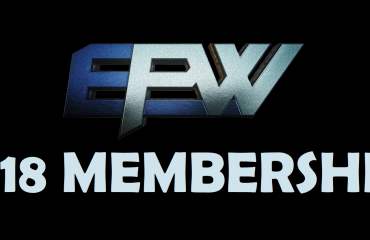 Much has been the story for The Australian Sensation so far in EPW, the numbers game has hit him early. In his losses against the likes of Tyler Jacobs and Taylor King; the chaos of the outside affected the outcomes in the ring. The Untouchables tried to work this to their advantage as an Amber distraction allowed Pitt to pounce right away. It continued to be an uphill battle for the Australian Sensation as TMDK‘s Untouchables double and triple teamed him on the outside of the ring. Craven would refuse to back down as he almost caught out Pitt with the backstabber. With the momentum on his side, the leader of the Swanton Squad looked to put away Pitt with the Swanton Bomb. However Damian Slater stepped onto the apron to make his presence known. The diversion allowed Pitt to shove Craven into the path of Amber who planted her heel through Craven’s jaw. This left him wide open for a Marcius Pitt F5 victory. Craven fought hard but this match showed just how difficult it is to overcome the strength of The Untouchables – who would only go on to get stronger by the end of the night!